Wykerstraße Whg Strandläufer is an apartment located in Ahlbeck, 900 metres from Ahlbeck pier. The apartment is 400 metres from Ahlbeck Railway Museum. The kitchen comes with a dishwasher and an oven, as well as a coffee machine. A TV is provided. There is a private bathroom with a bath. You can play mini-golf at the property, and the area is popular for golfing and horse riding. You can engage in various activities, such as cycling, fishing and canoeing. 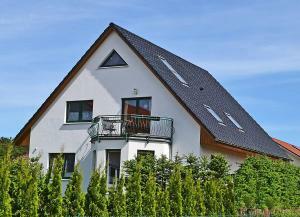 The nearest airport is Heringsdorf Airport, 7 km from the property.